NuLeaf Naturals are dedicated to providing all naturally-made CBD oils to their consumers to help them cope with different illnesses. The 1450 mg Full Spectrum CBD Oil for sale is already available on the market to help you deal with your condition. • Stress: Studies have revealed CBD oil’s antidepressant-like effects. It has also been shown to safely improve the symptoms of post-traumatic stress disorder (PTSD). The depression-reducing effects of CBD are fast and long-lasting. • Inflammation: CBD is a very promising cure for a variety of inflammatory and pain-associated ailments. It acts on the body’s cannabinoid system, reducing inflammation and balancing the immune system. • Anxiety: Studies have revealed that people with the generalized social anxiety disorder (SAD) can deal with the symptoms by using CBD. 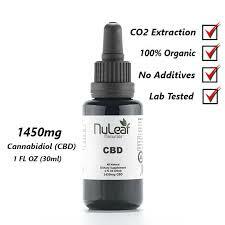 The 1450 mg Full Spectrum CBD Oil Hemp Extract from NuLeaf Naturals is the best choice for them. • Diabetes: Although marijuana use is known to increase appetite and calorie intake, it has been linked to lower BMI and reduced risk of diabetes. It has also been proven to reduce one’s chances of obesity. Quality: The CBD extract from the 1450mg Full Spectrum CBD Oil is extracted from therapeutic hemp plants that are grown organically – with no chemicals involved – on the licensed farms in Colorado, in the United States. NuLeaf Naturals uses the CO2 extraction method to get the cannabidiol, essential oils, terpenes, minerals, and vitamins from the hemp plant. Due to their natural, full energy, they work effectively to boost the healing effect of the consumer. Effects: The 1450 mg Full Spectrum CBD Oil has taken years of lab testing before it is sold to the public. It has undergone a number of tests to really prove that it can be effective in dealing with the many issues we face today thanks to the therapeutic benefits of the hemp plant. sativa which is grown on selected farms of Colorado. You can buy full spectrum CBD oil online at a very affordable price of $179. You can alternatively check the product out at https://hempworldstore.com/NuLeaf-naturals-brand-review/. Final Thoughts: This is a natural product you can use to treat yourself without bad side effects. You don’t need those painkillers anymore.